Congratulations on your purchase of a brand-new Grapefruit! Unlike the actual fruit, which is only a tasty snack, this Grapefruit is an app to help you manage your mental health. Grapefruit is based around building a daily habit of checking in on your mental health. 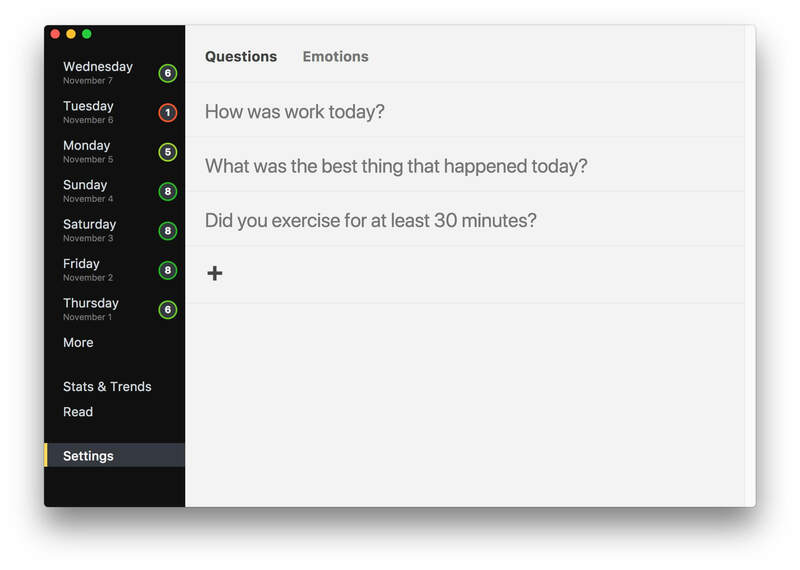 Each day, select that day from the left menu, and enter a journal entry where you see Today I..., then select a rating from 1-10, and any emotions you felt, and the answers to any custom questions you have set up. You can do it during that day, or when the day is done. Building this habit is a really effective first step in improving your mindset. It can reduce negative thoughts, and give you a new perspective on your issues so you can tackle them effectively. Once you build this habit, you can go deeper using the Read and Stats and Trends sections. Note: the screenshots shown are for the desktop version. The mobile version is similar, with a 'Home' screen instead of a left menu. We'll update this guide shortly, but I'm sure you can figure it out -- you're a smart 🍪! 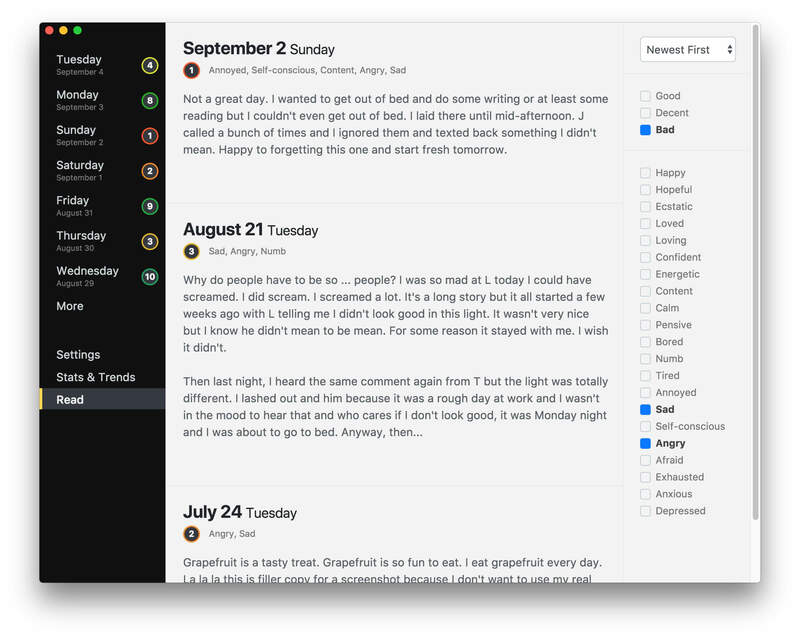 Your journal entry will save automatically and you can come back to it at any time. You can write as little or as much as you want. The typing area will expand automatically to fit the length of your entries like some sort of magic paper. A 10 is generally one of the best days you will have, and a 1 is one of the worst days you will have. A 5 or 6 is an average day with nothing special. You can rate a day without writing a journal entry, and vice-versa. On some days it can be particularly hard to write, so picking a number is an easy win to get those days in your journal. There's no right answer here. You can pick only one, or as many as you want. You can pick angry and happy in the same day if you feel one, and then the other. If the list of emotions doesn't resonate with your experience, or you think there are some missing, you can customize the list in Settings. To customize the list of emotions, go to Settings on the left, then Emotions on the top. Don't forget to hit Save after you make your changes! Settings don't autosave. If you don't want to track emotions, you can remove them all in the settings. Modifying the emotion list DOES NOT remove old answers, so you may still see old emotions on the stats page. Generally, these will come and go as your life evolves, but some may stay consistent. A good example might be how you feel about your job. You may track that for a while, see that it comes out positive over time, then remove the question and accept that your job is actually pretty good. You can add, remove or edit these questions as needed. You can also remove all of them if you just want a simple journal. Enter any number you want. This is similar to the ratings. You'll get circles with numbers you can pick one from. They will always start at 1 and go to the limit you enter. If the range is more than 20, or doesn't start at zero, we suggest using a Number. (Ranges can go all the way up to 99, but that's a lot of numbers!) If you only several choices of numbers, you can use an Option type. Type whatever you want! Good for keeping specfic questions separate from your Journal entries. Answer a "Yes" or "No" question. Select as many as you want from a list. Select only one from the list of options. Deleting a custom question DOES remove all of the previous answers and there's no way to get them back so be sure you want to delete one before you do! This gives you a list of all of your entries to date, as if you're reading your journal backwards. You can filter them using the options on the right, which is where the real power of this section lies. Select some emotions and/or rating ranges to filter the entries to review at different times. For example, if you're having a bad day then you can remind yourself of the good times by selecting Good on the right, with Happy or Excited as the emotion. Only days that match both the range and one of the selected emotions will be shown. Note: you'll need at least 5 days of data points to see anything here. Also it's important to know that they get more accurate with time, so don't rely too heavily on them in the first 30 days. Your experience will be unique to you, but testing has shown us that 60-90 days is often where they start to become really useful. On this page, you'll see a number of, well, numbers! And some charts and graphs and tables. Medium Days is the percentage of days that fall in the middle of your ratings. This can be large, which shows consistency in moods, or small, which can show a lot of volatility. How you might want to adjust that number is up to you. Maybe you want to go for more great days and fewer middle days, or perhaps you want a lot of middle days because that's a better baseline for you. Lastly is the Average Rating. This is, well, the average of all of your ratings. Like all of these numbers across the top, you can use this to get a general sense of how you're doing. They are good ones to keep an eye on over time. 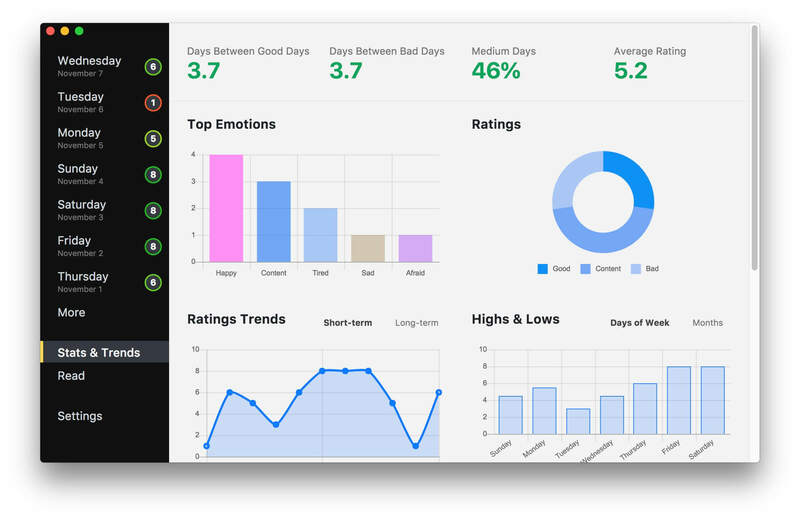 Top Emotions and Ratings are the first two charts that show which emotions you experience frequently, and how your ratings are distributed. Look at them together and you can get an overview of your life. Are you seeing positive emotions and a large amount of good days? Or the opposite? Ratings Trends and Highs and Lows show you patterns over periods of time. Do you have certain months and weeks that are better? Or are you fairly consistent? You can use the options at the top-right of the graph to switch between views. The Short-Term and Long-Term graphs won't be different until you've used Grapefruit for over 30 days. If you have set up custom questions, you'll also find stats those. Depending on the question and how much data is available, you'll find different sorts of stats. Sometimes you'll see which answers are associated with good or bad days, while others may show which emotions are associated with certain answers. How you interpret these and how you use the results of custom questions is entirely up to you! Thanks For Reading, Now Go Experiment! This guide is meant to get you started, but you can use Grapefruit however you want! There are tons of ways to use it, so make it your own.